This year has seen us host the 5th annual Bunker Camp at Dunstanburgh. 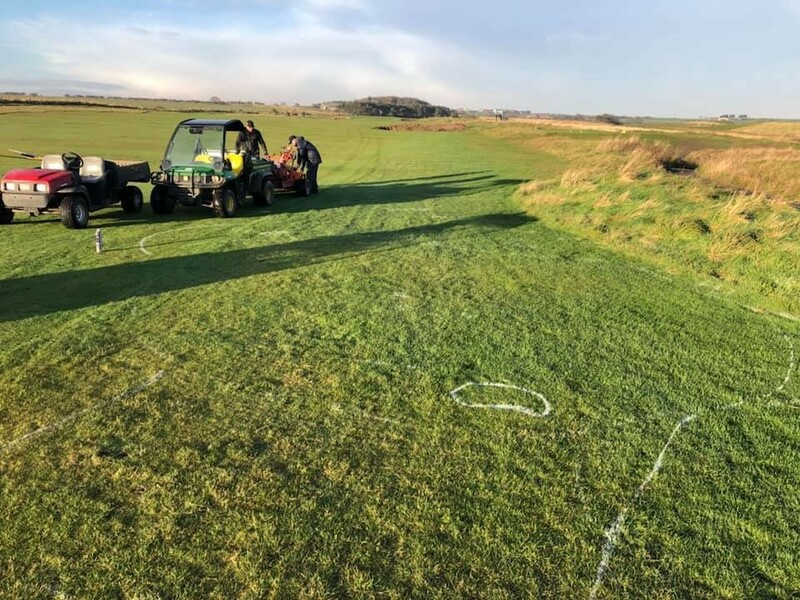 The bunker camp is a unique opportunity for greenkeepers around Europe to come to Dunstanburgh and learn the art of revetting bunkers, and experience the local working practices. 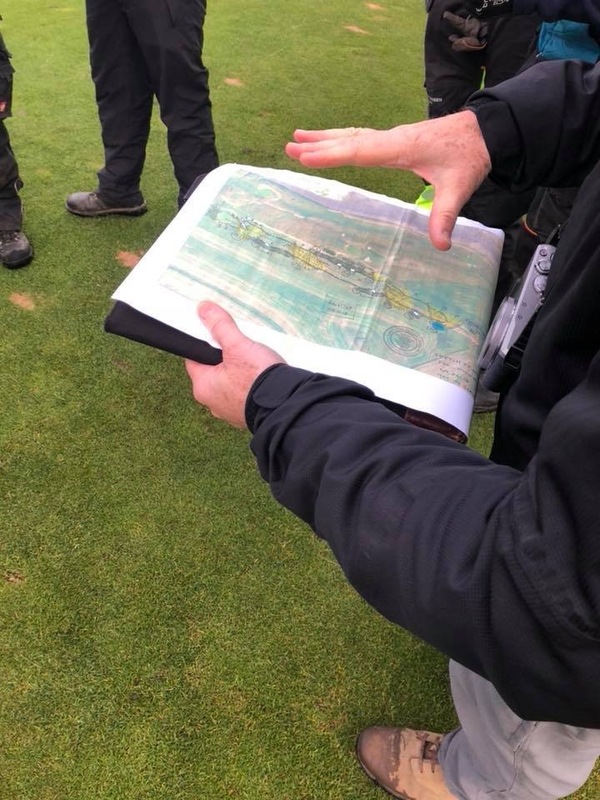 This is an unrivalled opportunity in the greenkeeping industry to gain some hands on experience in golf course design. This years project was to remodel the only par 5 on the golf course the 14th hole. The Greens team had a huge task on their hands, as this is one of our most poorly drained holes. 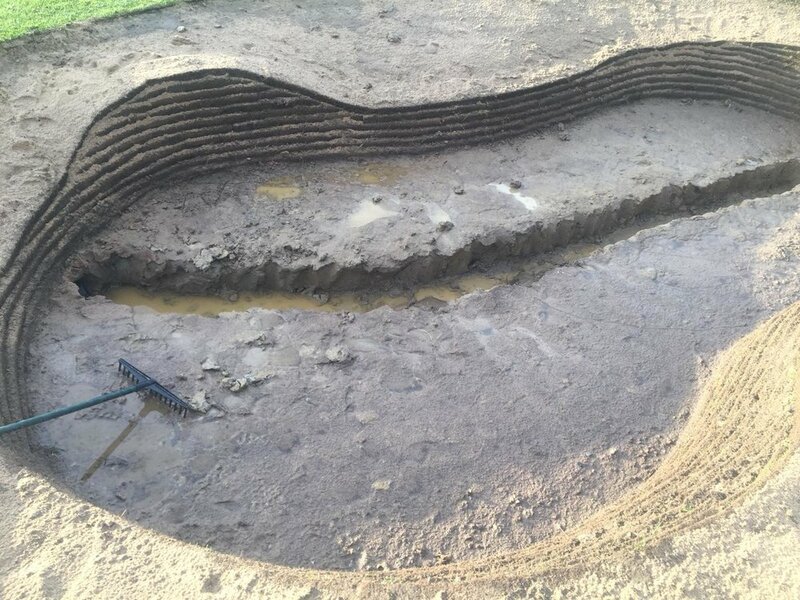 All the bunkers on the hole were going to get remodelled, major improvement work was needed around the green where drainage and a holding pond for storm water would be installed. Previously all the bunkers around the green would flood and in the modern game a real need to have your golf course playable is in the front of our minds and the management team at Dunstanburgh. A respect to James Braid and his architectural skills was also to be given a great lot of thought and all of our projects would need to have an influence by the 5 time open champion. 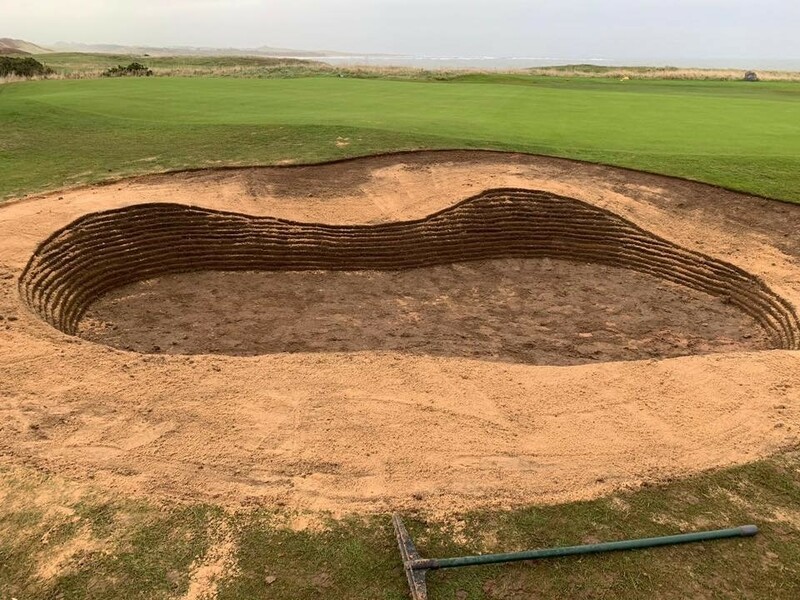 A total of 6 Bunkers on the 14th hole were going to be looked at, 5 existing bunkers were going to be remodelled and then a new bunker around 280 yards from the tee was going to be added. 2 Fairway bunkers were remodelled and a 3rd was added, we’ve tried to hide these bunkers into the dune line that separates the 14th with the 12th and 10th so we are going to allow the fescue rough to grow in behind, making them look more fierce than what they actually are, some shaping was required. James Braid was prolific in his architectural work as he stepped out of the playing limelight as an undisputed champion. At a time with minimal transport, designing so much in so many places was a truly remarkable achievement. He desgined wonderful masterpieces such as Aberdovey, Carnoustie, Southport and Ainsdale, Berkhamsted, Mere, North Hants, Goodwood and of course his beloved Gleneagles – Kings, Queens and Braid's Brawest, Somewhere on this list lies Dunstanburgh and some other north east gems like Goswick, Hexham to name a couple of others. 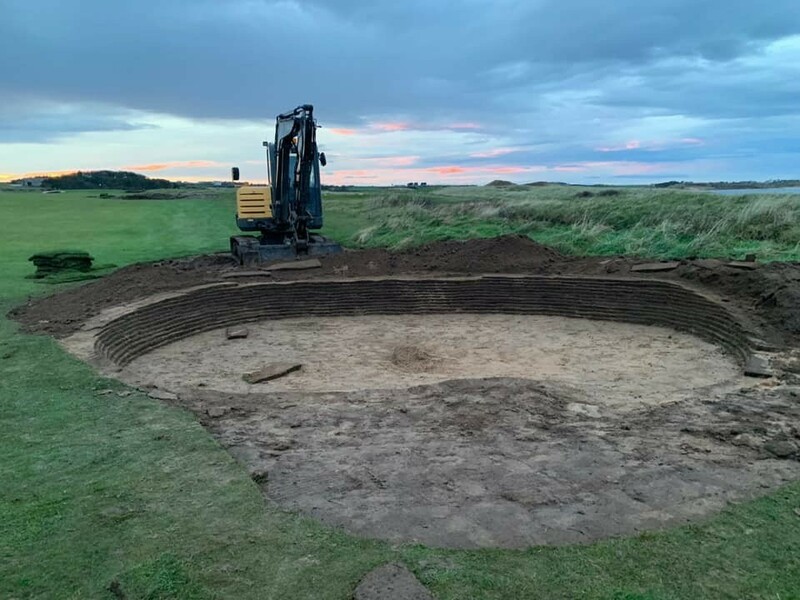 Throughout the last few years we have been restoring the bunkers on the Golf Course to reintroduce some original features of James Braid thorughout Dunstanburgh and this year was no exception. Braid once wrote "It is both necessary and desirable that the holes should be laid out as suggested by the lie of the land, every natural obstacle being taken care of." "There should be a complete variety of holes…not just length, but in their character – the way in which they are bunkered, the kind of shot that is required, the kind of approach and so forth." This year we had the help of Jonathan Gaunt to guide us in the correct direction to the thoughts of the great man himself. Some people say the links drains well, shame about our 14th hole, when the golf course was remodelled in the 60’s the course adopted some farm land to create some extra holes, Our 14th lies in the heart of the farm land that was adopted. Its heavy clay and has been in desperate need of drainage improvement for many years. Everything needs water to survive, and the more you can supply, the greater the variety of wildlife so the decision was made to create a holding pond to act as a filter before the water went out to sea. The 14th project required a lot of earth moving so some of the spoil that was left over we revamped the 11th medal tee that was in need of enlarging, we were lucky enough to Turf on this stunning morning. To the joy of our members the 9th Fairway bunker has been moved over by 4 metres, and is less lightly to be in play, but its an important visual for the stroke index 1 hole. The week seen numerous greenkeepers from around the UK and Europe attend the Bunker Camp here at Dunstanburgh. We couldn’t have done this work and achieved the standard without all the volunteers, its been an amazing 2 weeks and yes we will return next year for another Bunker Camp in November. Dates TBC. To conclude this years bunker camp as a great success and major improvement to the 14th hole, I’d like to again thank all the volunteers, sponsors, supporters and all members and visitors here at Dunstanburgh for supporting this great event. We will see you all next year, dates will be released via ‘thebunkercamp’ Facebook page, please like and follow us if you would like to get involved or keep up to date with next years Camp.